The time and effort that goes into the creation of book covers is often overlooked, but some of the original artwork for the cover of childrens book Charlotte's Web, created in 1952, has just sold in New York for $155,000 (£97,000). Sold at auction by Heritage Auctions, the artwork for EB White's books was drawn by Garth Williams and brought in more than five times what was expected at the auction, making this a record for the artists work. 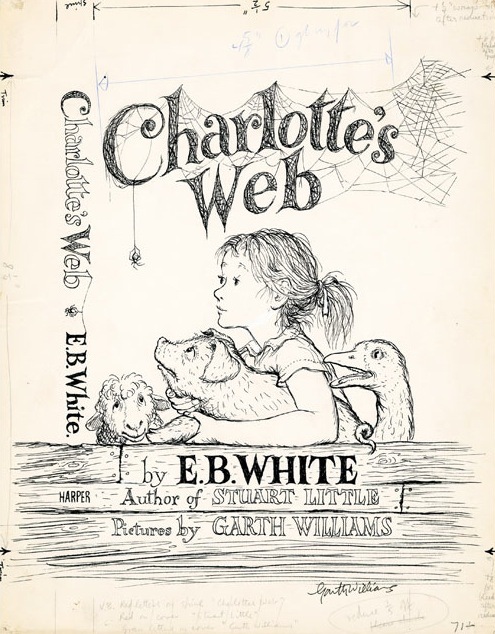 Charlotte's Web is a book about a friendship between a spider and a pig, and the particular artwork was one of 42 original drawings for the book which were put up for auction by the late artist's family. All together the 42 illustrations brought in a total of $780,245 (£487,927). The cover illustration is said to have been bought by a New York collector whose name has not been released, but shows that there is a firm collector base for these sorts of drawings and a fondness for the illustrations of classic tales in particular.